In an academic paper In Other Words: The Indian City and the Promise of Citizenship, Jankaji Nair from the Centre for Historical Studies at New Delhi’s Jawaharlal Nehru University (JNU) asks, “Can the mere refusal to be visibilised, by planning agency, law, census, and now in the pernicious plans for unique identity (UID), add up to social justice in the city?” The synonyms of the word ‘pernicious’ include malicious, wicked, evil and malevolent. It is becoming abundantly clear that the market, rather than the state is attempting to define the identity of a citizen, amidst ‘mutinies’, ‘adjustments’ or surrender by them to avoid a ‘fugitive’ existence. The right to the republic, in particular, and right to have rights in general are increasingly getting determined by ulterior motives of global finance, which wants free trade in all sorts of data at any human cost and even at the cost of sovereignty. Kamal Sadiq in his book Paper Citizens: How Illegal Immigrants Acquire Citizenship in Developing Countries published by Oxford University Press in June 2011 has argued that although citizenship is ‘expressed through documents’ but the process of creating the document (for Right to Identity) is not the consistent monopoly of the state. His reference to the phenomenon ‘documentary citizenship’ is quite relevant in the context of biometric documentation being bulldozed down the throats of Indians. While it is not crystal clear as to whether those citizens who obtained citizenship through registration and documentation can and should be allowed to have the right to deprive natural citizens of their rights as is being done by Sonia Gandhi and Rahul Gandhi. Under the influence of cartels of ID cards if they are allowed to establish that it is documents that create citizens and not the states it will a deeper affront to the episteme of natural citizens from artificial citizens. The latter seem to remain foreigners in local communities. The rights of natural citizens go beyond proof of documentation. At page 198 Kamal Sadiq writes, ‘The bounded nature of citizenship, where the nation-state was a container for all rights, has eroded because of its dependence on documents. Citizenship is no longer a secure political realm…documentary citizenship presents a serious problem for our understanding of the composition of states’. Some artificial citizens whose rights are documents based are out to disinherit the natural citizens of their rights by initiatives like biometric identification. Such initiatives merit robust resistance from the natural citizens. Kamal Sadiq points out the ability of documentary citizens to partake in the political affairs of a country – vote, run for public office, while retaining their previous sense of nationality and belonging. He makes a case that documentary citizenship undermines state sovereignty. In an article dated 18 January 2014, Nick Turse, the co-author of The Changing Face of Empire: Special Ops, Drones, Spies, Proxy Fighters, Secret Bases, and Cyber Warfare, Terminator Planet: The First History of Drone Warfare, 2001-2050 underlines that as of 2013 elite US forces are deployed in 134 countries around the globe. It is not about whether or not Government of US or its allies who are part of Five Eyes intelligence alliance or government of China is being hostile towards India and Indians. It is about whether as a nation are Indian political parties, battle ready in the event of such calamities. Aren’t centralised electronic and biometric databases of Indians, vulnerable assets? Notably, The UN resolution was passed by the General Assembly on 18 December 2013, as ‘Right to Privacy in the Digital Age’. It was sponsored by more than 50 countries, including India, and approved unanimously by the 193 members. The resolution has requested Navi Pillay, the UN High Commissioner for Human Rights to submit a report on the protection and promotion of the right to privacy in the context of domestic and extraterritorial surveillance and/or interception of digital communications and the collection of personal data, including on a mass scale, to the Geneva-based Human Rights Council at its 27th session and to the Assembly at its 69th session. The ruling parties in India are violating these rights and, wittingly or unwittingly, opposition parties have become complicit in surveillance exercises in the name of delivery of welfare services for the poor. The US resolution deals with the emerging question of cyberspace privacy. The UN General Assembly has established, for the first time, that human rights should prevail irrespective of the medium, and therefore the need for protection both offline and online. But does electronic and biometric surveillance bother the political parties who are part of the ruling coalition led by Sonia Gandhi, Rahul Gandhi and P Chidambaram? Does it perturb the opposition parties led by Lal Krishna Advani, Narendra Modi and Sushma Swaraj? Do the parties who seem to belong to the federal front of Nitish Kumar, Arvind Kejriwal, Navin Patnaik, Mamta Banerjee, Jayalalitha and Mulayam Singh Yadav concerned about the corrosion of sovereignty? Does it matter to the parties of the secular front which has been proposed by Prakash Karat? The stance of these political leaders on biometric identification reveals their character as to whether they wish to be deemed legitimate opposition parties to fight for the political rights of citizens, or they wish to remain wedded to ruling coalition with mere token oppositionism. Each of these parties seem to have failed in their political duty to announce whether they support or seek scrapping of biometric identification that violates the fundamental ’tenet of a democratic society’ and the ‘Right to Privacy in the Digital Age’. After the UN resolution, US president Barack Obama has attempted to unsuccessfully defend the indefensible acts of surveillance on 17 January 2014. He claimed that National Security Agency (NSA) was created to give us insights into the Soviet bloc. He referred to “totalitarian states like East Germany offered a cautionary tale of what could happen when vast, unchecked surveillance turned citizens into informers, and persecuted people for what they said in the privacy of their own homes”, but by implication underlined that the in the post-Soviet bloc era, democratic countries are being turned into totalitarian states through indiscriminate profiling of citizens through US based companies or through the allies of US. Can Indians trust likes of P Chidambaram, Sam Pitroda, Montek Singh Ahluwalia, Nandan Nilekani and C Chandramouli, who are collecting our data just because they say that their heart bleeds for the leakage in the system for the sake of the unreached poor? Chidambaram’s election to Parliament faces challenge in the court. Other big data players of his ilk have become a challenge for the legislature itself because they are cabinet ministers without any oath of secrecy, office or accountability. Has the link between big data like Centralised Identity Data Repository (CIDR) of biometric Aadhaar number and National Population Register (NPR) numbers and violation of right to privacy been studied prior to their launch? The silence of India’s political class in general and opposition parties in particular on the issue of UN resolution, surveillance regime of the victors of World War II and automatic identification in the digital age is deafening. Aadhar is another criminal enterprise of India's majoritarian, sociometric kleptocracy. It is already being used to harass hapless citizens in every walk of life while the judiciary turn their habitual blind eye to the depredations of the wealthy and the powerful. Nandan Nielkani, and apposite Khangress Walla MP in the making has already decalred his freedom and right to sell the date base as commercial enterprise. As mentioned in the first part, the Aadhaar, LPG refill subsidy and direct benefit transfer (DBTL) scheme is in to complete mess. The ‘larger than life’ claims made by the proponents of Aadhaar, especially IT Czar Nandan Nilekani, are falling flat in practice. 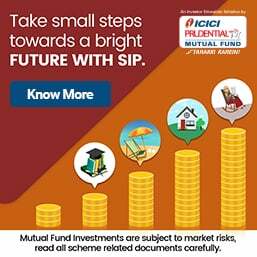 Can the Unique Identification Authority of India (UIDAI) explain why people are not receiving LPG refill subsidy on time and into their own lined bank account while people not related with these are receiving SMS about LPG subsidy? The mess is created under the pretext of unique identification (UID), which was then penetrated into the LPG subsidy through banking system. All this was done without taking into consideration the issue and problems of LPG refill distribution and banking system. This has resulted in citizens suffering at the hands of LPG distributors under the pretext of Aadhaar, which is meant for residents. According to Justice KS Puttaswamy, the retired judge from Karnataka High Court, who had filed the public interest litigation in the Supreme Court, government schemes (of making Aadhaar mandatory) cannot be imposed upon people. Speaking with Citizen Matters, Bangalore, Justice Puttaswamy had said, "An interim order is as much as a final order. So presently all these government schemes cannot be imposed upon people. And if it is done, it is contempt of court. The interim order does not mention any names of schemes. But under this, no one can insist of Aadhaar for any government schemes like ration card, bank account, cash transfer, issue of LPG subsidies and so on." Another interesting aspect of the whole Aadhaar drama is Congress and most political parties are avoiding taking a clear political position demanding scrapping of the biometric identification exercise and are speaking with forked tongue. Congress vice president Rahul Gandhi’s speech last week is nothing but another example of bluffing. When finance minister P Chidambaram said there is a need to increase the quota for subsidised LPG refill to 12 from nine, both oil minister Veerappa Moily and oil secretary Vivek Rae were quick to rule out the hike. However, as soon as Rahul Gandhi expressed the need to increase the quota, the same Moily was quick to say that his ministry would put forward such proposal before the upcoming cabinet meeting. This shows the politicisation of LPG subsidy, especially looking at the general elections in next few months. It must be noted, it was the same Manmohan Singh-led government, which capped the subsidised LPG refill quota to six cylinders per year in September 2012. Following outcry from several quarters, in January 2013, it was increased to nine cylinders. The original idea behind the cap in LPG refill cylinders was to reduce the subsidy bill of the government. If the UPA government is interested in reducing subsidy bill, then why not scrap it in one stroke, instead of playing hide and seek games with common citizens? Interestingly question though, what has changed between January 2013 and January 2014 that required intervention from the ‘pseudo supreme’ authority of Congress to lobby for increasing the LPG refill per year to 12? It is nothing but vote bank politics to appease voters before the general elections. Hope the same thinking would be applied in scrapping the UID/Aadhaar project as well from the Congress high command, which still reportedly has not enrolled for the scheme. In a country like ours where illiteracy is rampant and the average citizen is already burdened with different cards for different purposes- voter ID card, PAN card, BPL card, the forceful linking of Aadhaar with LPG refill subsidy is only burdening the common citizen. Hope the Supreme Court takes the OMCs, Oil Ministry and the UPA government to task and put the illegal ‘Aadhaar business’ to an end. Most importantly, as Moneylife has been writing, the basic issue in India and its over billion citizens are not about subsidy, but it is about demand and supply gap. Citizens are being deprives their rightful benefits because the middleman-politicians-babu nexus is siphoning off the benefits before it reaches the end user. For example, citizens from a far away village are not receiving foodgrains because of the nexus. And directly transferring subsidy money in to these people’s bank account (if they have one) is not going to ensure that the foodgrains reach the village. This is because if the foodgrains are siphoned off before reaching the village and public distribution (PDS) shop, then how and from where these poor people are going to buy it? Anyway, that is subject for another article. Here we will discuss about the LPG refill subsidy only. There are basically two types of LPG customers, one who has linked their Aadhaar and bank account and two, those who have not done so. Such customers are being flooded with SMS to enrol for Aadhaar and link it to their bank account and subsequently provide the details to their LPG distributor. However, with the interim order of the Supreme Court being in force, the LPG distributor and OMC cannot deny the rightful subsidy to the rightful customers. This means, any LPG customer, who may or may not have submitted the Aadhaar is liable to get the nine subsidised LPG refills for FY2014 (unless the OMCs increase it to 12 refills per year following the diktat from Rahul Gandhi). As Moneylife wrote, in one glaring example of misuse of powers, one distributor from Hyderabad not only denied a LPG refill to a customer despite showing willingness to buy it at market rate. Going one step ahead, the distributor even blocked the connection of the customer for not providing Aadhaar. Major issue these customers are facing is about receiving LPG refill subsidy on time and the communication. Several customers are still waiting for their subsidy to be deposited in their bank accounts. In the meanwhile, many had to buy the LPG refill at market rate that is without the subsidy. At present, the open market rate of a domestic (home use) LPG refill costs Rs1,275.5 while the subsidised refill costs Rs455. The subsidy amount in this case works out to be Rs820.5, however, the customer is getting only Rs794.84. This means he will have to pay the differential amount from his own pocket. In addition, there is value added tax (VAT) and income tax that the customer will have to pay. The subsidised cost of LPG refill included all taxes, but for non-subsidised LPG cylinder the customers will have to borne the cost. In addition, since the money would be deposited in the bank account, it would be considered as ‘income from other sources’ and the customer would have to pay income tax, as per his/her obligations under appropriate slab. Mathew Thomas, a former defence services officer and missile scientist turned civic activist, who is campaigning against state database control of the people, has already sent notices to the UIDAI, MOP&NG and all three OMCs for the contempt of Supreme Court order. Similarly, if you are being deprived of your rightful subsidy for LPG refill (nine cylinders at present), you can do several things. But you need to act fast, on your own. 1. Write a letter (email) to your LPG distributor giving reference of the Supreme Court order and ask why you have been denied subsidy for your rightful nine refills. 2. Send a copy of your letter (email) to the oil marketing company like HPCL, BPCL or IOC. 3. Make full use of the online portals of all OMC that shows the record of your LPG booking, delivery and subsidy. 4. Mention in your letter that as per the Essential Commodities Act, the OMC and distributor is mandated to deliver the LPG cylinder at your home within 48 hours of booking. As most of the distributors don’t follow this, you can tell your distributor that you would file a complaint before the Consumer Forum. -Bookings for the gas cylinder must be accepted over the phone. -The gas cylinder should to be delivered within 48 hours of booking. -The customer has the right to weigh the cylinder on taking delivery. -Gas agencies must be open for business between 10am and 6pm, except on public holidays and Sundays. 5. Also inform the LPG distributor that his/her act is contempt of Supreme Court order and you would be compelled to write to the Chief Justice of India for it. 6. If the LPG distributor/OMC continues to act high-handedly, then write to the Chief Justice of India (with supported documents), requesting the Court to take suo moto action for contempt of court order against your LPG distributor, the OMC, Ministry of Petroleum and Natural Gas, the minister of MoP&NG and last but not least, the Prime Minister. You can also include Nandan Nilekani, the chairperson o UIDAI, the UIDAI and Planning Commission (as UIDAI works under it). I am enclosing a copy of the Supreme Court Order dated 23 September 2013 indicating that no person should suffer for not getting the Aadhaar card in spite of the fact that some authority had issued a circular making it mandatory. Your persistent demand for Aadhaar for me to claim the subsidized LPG refill cylinder entitled by me continues to cause my family suffering as I do not have an Aadhaar, do not wish to obtain one, and certainly do not want to link it with any bank account. According to the Union Minister for Petroleum and Natural Gas M Veerappa Moily, 'Over 14 crore people in the country have LPG connections. However, three crore among them have got connections by producing fake documents’. Clearly the 11 crore honest and law-abiding citizens do not need to be made to suffer Aadhaar numbers or bank accounts? Surely you cannot be placing blind faith on using a random number assigned by the UIDAI to a set of unverified and unaudited demographic and biometric data submitted and maintained/ operated by private parties who are paid for every record they submit in preference to your own records that you seem to have audited and have used all along? What purpose does this suffering serve? Surely you know that through its notification of 28 September 2011 the Reserve Bank of India suspended the “Anti-Money Laundering” Rules for bank accounts opened with Aadhaar as the sole KYC? Surely you know this makes it possible to transfer subsidy to unverified accounts operated by anyone who has hold of the Aadhaar-linked bank account? Surely you cannot want to cause people to suffer the embezzlement of their subsidy? I urge you to immediately discard any linkage or use of Aadhaar with your databases and revert to the time tested practices of issuing subsidized cylinders. The author of the article has not yet posted a specific response to the parting comment in my previous post. It can only mean that either he does not read the viewer's comments OR he does not have a truly effective way the opponents of Aadhaar can continue the fight OR he was not being too serious by suggesting ineffectual measures. Mr. Sapkale, would really appreciate your guidance, shared here for all to benefit. Thanks for posting your comment. We appreciate the efforts put up by you for resising the Aadhaar linkage with LPG subsidy. What you had mentioned in your previous post is related with associating your PIL with the one ongoing in the SC. And you seems to know all the legal options, so we refrained from advising you. This article is written for common readers seeking suo moto intervention of the Chief Justice. For this you need to write separate letter as stated in the article. Subject: Request your Urgent action for "LPG DBTL" scheme without any delay. Please note the following points and request your Urgent action for "LPG DBTL" scheme without any delay. 4) Received SMS intimation having transferred Rs. 730.43 towards Cash Receipt No. 175559 dated 12Feb2014. Under my worked out calculation of Rs.738.50 – Rs. 730.43 = Rs. 8.07, has some difference. It seems I have received Rs. 8.07 less towards DBT in my account. To avoid such confusion, to make Citizens aware of the subsidy burden by our Nation, and any manipulation through malpractice, concerned authorities should and must give complete breakup in Cash Receipt for all kind of Domestic-Non Domestic LPG Cylinder supply delivery. Adamant, stubborn concerned authorities should Stop DBTL or make it optional, if not interested to implement proper breakup in Cash Receipt for easy verification of DBT amount and actual subsidized cost of cylinder for Consumer. 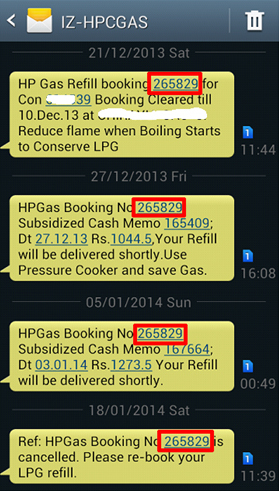 HP-Gas has not provided direct email IDs, no provision to escalate complaints. One has to fill the on line complaint under Others category, and no category for DBTL problems-issues is provided. You are requested to do the needful and oblige. (No proper reply to my online-complaints from HP-Gas. Issues raised are beyond our scope to address. Make Compulsory to issue all consumers complete break up details like Tax, Subsidy, DBT, etc of cash paid in Cash Receipt of Domestic LPG supply. Presently only consolidated amount is shown without any breakup details. If Aadhar is not mandatory to buy subsidized LPG cylinders, why DBTL is made mandatory for Consumers already forced to register??? DBTL also should be made optional for those Consumers who were forced to register for DBTL. Several similar emails sent earlier from past so many days to all the possible concerned authorities( lokayukta, Food Offices etc. but no action so far. Sorry MDT you seem to have misread what I wrote/meant. It is that only after my PIL was held as untenable (incidentally, according to TOI of 24/1/14, Page 9 of the Nagpur Edition, a similar PIL in the Madras HC a few days ago has been entertained, illustrating the inconsistency within the Judicial system), that I wrote to the CJI and SC with a simple request to take suo moto action for Contempt of Court against all Respondents. This is exactly what the author recommends, which I state is an ineffectual action. Hence, my query still stands and hope the author can provide guidance for steps which would turn up results. the veerappa moily agreeing to 12 cylinders as soon as rahul gandhi dmenads it. cbinet scrapping of ordinance on his tearing it , and maharashtra cabinet reconsidering adarsh report, all this demands whether the cabinet ministers are fit and proper to run this govt. they are misusing the powers to give cheap publicity to rahul gandhi during elelction year. it is clear breach of trust by cabinet ministers. Since September 2013 I have been fighting a lone anti-Aadhaar campaign from Nagpur. Having my PIL being asked (by the HC Bench in Nagpur) to combined with the Writ before the SC, I wrote directly to the CJ, both via email and Acknowledgement Due Speedpost, to take suo moto action against the Respondents. The only long delayed response I received was from an Asst. Registrar, saying that under Supreme Court Rules 1966, my request was not tenable. A lawyer friend of mine has also made a similar request to the CJI, with no response at all. I continue to not register or take part in this crackpot Aadhaar scheme, promoted to satisfy the vaingloriousness of NN. Hence, has the author of this article verified the efficacy of the course of action he recommends to opponents like me? Hence, has the author of this article verified the efficacy of the course of action he recommends to opposers like me? I am in full agreement with everything that is stated in the report. I wish to point out that Publc Sector Banks are already facing extreme difficulty in handling pension accounts and their counters are thronged by hundreds of pensioners in most branches particularly during the first week of very month. They are already burdened with having t o meet several targets- of Deposits, Advances, NPA reduction, Third Party Products, SME, Retail, and other sectors of advances part from CASA targets. I am of the opinion that at present, Banks are ill- equipped to handle the subsidy for LPG through Aadhaar linkage. Complaints are going to be plenty, and redress all will be a huge problem. I envisage a huge scam emerging if the subsidy distribution is entrusted to PSB's. Why dump the present system and resort to touching of the nose in a round-about way via the neck? We want efficiency, and clean administration. Not a messy situation where everyone would be in trouble. I hope the government listens.mit is not going to be a game- changer. It is going to be a total wreck. I want to know if I can un-register my aadhar card with the distributor ? Unfortunately there is no grievance redressal mechanisam available in the Aadhaar system of UIDAI. to file complaint with your distributor, OMC and send copies to the Supreme Court and Oil Ministry. You can also file complaint online with your OMC and follow it with an RTI. However, despite this clear ruling, state-run oil marketing companies (OMC), like the Hindustan Petroleum Corp Ltd (HPCL), Bharat Petroleum Corp Ltd (BPCL) and Indian Oil Corp (IOC) are enforcing citizens to compel with the UID/Aadhaar requirement. This is not only causing troubles to citizens but lakhs of them are facing hardship due to the forceful implementation of Aadhaar for cooking gas (LPG). And this is not limited to people who have not submitted their Aadhaar. Several consumers, who have enrolled and submitted their Aadhaar to the LPG distributor, are either not receiving the subsidy on time or not receiving any SMS. On the other hand, several people are receiving SMS about the LPG refill booking, cash memo and delivery, for a consumer number that is not theirs. For example, I have neither enrolled for the Aadhaar nor I have linked my bank account with any UID number. Yet, I continue to receive SMS from my OMC giving details, about subsidy being deposited into a bank account that does not belong to me. Despite complaining to the OMC and LPG distributor, there is no action to delink my mobile number from the other consumer. There are two things wrong in these messages. One, the consumer number does not belong to the reader and second, he is still waiting for his rightful delivery of LPG refill since more than 20 days. Interestingly, he still has to get the subsidy for his last refill and the distributor had told him that he would receive it in next 10-12 days. 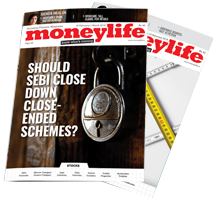 Several readers of Moneylife have complained about threats being received from their LPG distributors for submitting the UID/Aadhaar number. All the distributors are using the one line threat, "You will not get any subsidy, if you do not provide your Aadhaar and link it to your bank account." Even the social media is full of people who are having a tough time due to Aadhaar linkage with LPG refill and subsidy. Here is one such tweet that shows the mess of Aadhaar, LPG refill booking and direct benefit transfer (DBTL) scheme. The person has received subsidy through DBTL in his bank account without him booking the LPG refill! Meanwhile, the OMC continue to send SMS asking people to submit their Aadhaar number to LPG distributor and link it with their bank account. This is not only illegal but also can be construed as contempt of court. Under Article 141 of the Constitution of India, "the law declared by the Supreme Court shall be binding on all Courts within the territory of India." To declare means to announce opinion. Thus the law declared by the Supreme Court is the law of the land. It is a precedent for itself and for all Courts, Tribunals and authorities in India (Rupa Ashok Hurra vs. Ashok Hurra (2002) 4 SCC 388). Following the interim order from the apex court, the Ministry of Petroleum and Natural Gas (MoP&NG) filed an ‘Application for clarification/ modification of order dated 23 September 2013. The Supreme Court, however, simply refused to do so. On 26th November, the Supreme Court said, its 23rd September order remains unmodified. Yet, HPCL, BPCL and IOC and their distributors continue to harass customers under the name of Aadhaar. This is despite, the Nandan Nilekani-led Unique Identification Authority of India (UIDAI), maintaining its UID or Aadhaar is 'free and voluntary' and is meant for 'residents'. The Supreme Court is likely to hear the matter on 28 January 2014 and take these ‘welfare agencies’ and the concerned ministries to task. Indane consumer No. 4306 from West Bengal. I enrolled my aadhar No. for DBTL in compliance of Govt notifications. And now I repent my act as I am not receiving subsidy in my accredited bank a/c. I got supply of my last refill purchaed at market price on 5.2.14. And now as on 5.3.14 I have not received my eligible subsidy. Complaint lodged with Indanes' Transparency Portal yeilded no result. SIMPLE COMMON SENSE DOES NOT EXIST WITH THE UPA GOVT. FOR 50 YRS. OF INTOXICATED POWER! IT IS A SIMPLE ARITHMATIC OF 2ND GRADE! FIRST 9 OR 12 CYLINDERS FOR ALL CONSUMERS UNDER THOSE NOS. WHICH ARE BILLED OFFICIALLY BY ALL LPG COS.& DISTRIBUTORS IN A YEAR CAN EASILY PROGRAM THEIR SYSTEMS SUCH THAT THOSE FIRST 9 OR 12 CYLINDERS ARE AT SUBSIDIZED RATES & IF AT ALL MORE, RAREST OF RARE, CAN BE SUPPLEIED AT A HIGHER RATE. THIS DOES NOT REQUIRE A STUPID NATIONAL EXERCISE WASTING MILLIONS OF PEOPLE'S PRECIOUS TIME, EFFORT, MONEY & WASTE OF PAPER, POWER, ENERGY TO DO SUCH A MUNDANELY STUPID EXERCISE! BUT BRAINS ARE A PREMIUM COMMODITY WITH GOVT. OF THE DAY WHO HAVE CREATED A NONSENSE OF AN ENTIRE NATION & ALL THE SYSTEMS. I have the same problem i got 2 msg regarding the amount credited to my account but no such amount has been credited in my bank, how can i now cross check as the gas distributor is completely blank on it............please suggest me. Would request you to check the second part of this series, which gives details about getting justice. In your case, it would be apt for you to file complaint with your distributor, OMC and send copies to the Supreme Court and Oil Ministry. You can also file complaint online with your OMC and follow it with an RTI. Relevant organizations should bring Stay Order on DBT to bank account in case of LPG subsidy for all Citizens of India. Maximum they can link Aadhaar for additional ID record after verifying correctness in LPG book issued to Customer. This is easily the most audacious disrespect of the Supreme Court. The order is simple and straightforward and yet, for reasons best known to them, derive sadistic pleasure by making things complicated.